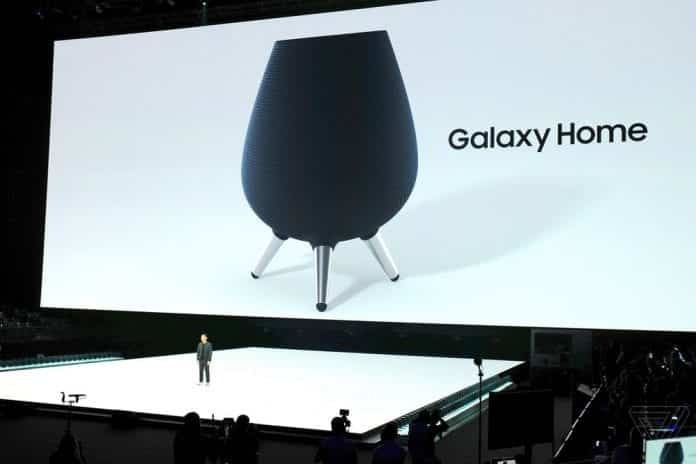 Samsung introduced its first smart speaker, the ‘Galaxy Home’, during its Unpacked 2018 event in Brooklyn, New York on Thursday. Expected to take on Amazon.com Inc.’s Echo, Alphabet Inc.’s Google Home, and the Apple HomePod, Samsung’s Galaxy Home is powered by its artificial intelligence (AI) voice assistant, Bixby, for voice commands. Similar to Apple’s HomePod, the Galaxy Home is designed to deliver music first and answer questions second. The AI-powered speaker is meant to be a smart-device hub, giving customers the ability to play music or control smart home devices such as door locks or lights without the need to lift a finger. The Galaxy Home has eight microphones that register questions from users to its voice assistant Bixby. The device also features full-range speakers that are designed to produce sound in all directions. Just like Apple HomePod, it can also direct sound at you depending on where you are in the room rather than spreading it around a room. It uses Harman natural sound processing for improved surround sound experience and also houses high-quality sub-woofers for rich bass. The speaker which has a mesh black design includes audio tuning from AKG and a tripod-like stand. Samsung also announced that it had partnered with the world’s biggest music-streaming service, Spotify to launch its new product. It demonstrated how Spotify can easily be played across Samsung TVs, phones and the Galaxy Home speaker. Spotify will be the default music streaming service on the Home speaker. “We had to make sure that they share our values and are committed, long-term, to helping people enjoy music in new ways,” Samsung product marketing senior director Drew Blackard told the audience at Brooklyn’s Barclays Center. As part of the collaboration, Spotify will create apps for several Samsung smart products, including appliances, chief executive Daniel Ek said. “Samsung makes devices for every aspect of our lives; really everything from smartphones to TVs, to tablets, speakers, watches, and even refrigerators,” Mr. Ek said. Not much information was shared about the device by Samsung during the event, as the tech giant called the announcement a preview. Also, no sale date or price was shared by the company. More details are expected in November during the Samsung Developer Conference scheduled to take place on November 7 and 8 in San Francisco.